The Second annual PFF Baja California Saltwater fishout recently took place in October. There were four participants returning this year to challenge the mighty pescada of the area. Surviving the plane flight and arriving in La Paz to partake in the joys of saltwater fly fishing, for both in shore and off shore species, were Dave Mann, Ed Welch, Igor Doncov and Rich Catanzaro. After arriving in La Paz we were picked up by the shuttle service and driven to the hotel. Where we shortly settled in that evening to begin a daily routine. Each day we would wake at approximately 5:30 AM, have breakfast at 6:00 AM and then go to meet the boat guides and start the day. The daily agenda was similar yet different. In the morning the first order of business is locating and netting sardines. Why sardines? 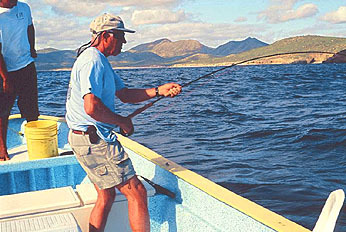 The type of fly fishing in this area requires bringing the off shore species up from the depths to a casting range, so that the fly could be utilized. In order to attract suitable species of fish to a casting range sardines are cast upon the waters. If there are fish in the area they would usually show and take the sardines as a first course. Hopefully, we can then offer the second course, our fly, and hook up. If you were simply looking to load a cooler and take fish home you would use live bait. There is no way a fly fisherman could possibly compete with conventional gear and live bait. But that was not our purpose. The days would also differ in the types of fish we would encounter or the condition of the wind and seas. Ed and Dave fished together, and Igor and I fished together. Ed and Dave?s guide was a bit of a maverick who would venture away from the armada seeking his own space. 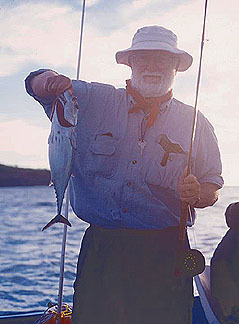 This paid off and they were into several species of fish, both inshore and offshore varieties. Our guide was more intent upon staying near the main body of boats that surround the productive waters of known fish. He was attentive to our desires and would venture away from the main body of the fleet to satisfy our singular desire to fly fish. This required that he search for schools of fish away from the armada and live bait fishermen. The first day Igor and I had the opportunity to fish inshore, as our guide netted the sardines used to chum the fish into range, we cast for wayward fish feeding on the bait fish cast into the water from the guides net. Cocineros, green jacks, are tough customers that readily take the fly. While netting the sardines it is not unusual to catch 3-4 Cocineros. Later that day, after leaving the shore line, we ran into a school of Skip Jacks. These tuna shaped speedsters of the deep bust the water chasing sardines and readily take flies. The problem develops, what do you do with a 8-12 lb. powerful fish once you hook it? Following the initial run the fish then dives and remains determined to stay away from the boat at some predetermined depth. After a grueling battle the fish may tire and be brought to the surface. 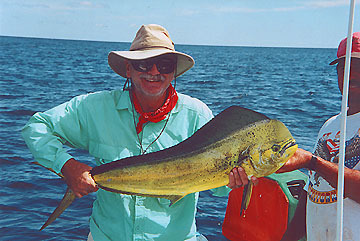 Igor quickly dispatched several of these guys and was hooked up when a school of Dorado arrived. Using my popper I quickly cast to the leading fish. I was immediately hooked up, but not for long. The hook pulled out. I had two more missed hookups or long line releases before my fourth fish was solidly hooked. It took off at about thirty miles and hour across the water and began a series of jumps and runs that soon was in the backing. There few more exciting events in fly fishing than seeing these big game fish speed through the water and go arial time after time. It all happens that fast. You hook up and better get those fingers out of the way of your reel handle, it?s going to sing. By this time Igor had landed his skippy and was hunting the remaining Dorado. As quick as you knew it, he was hooked up and fighting the blue lighting bolt. We both landed our fish and was soon looking for more. The Dorado were gone and we were moving on to other waters. That evening, in the Dining Room, we had the opportunity to discuss the prior weeks action with Ken Handley. Ken informed us of the 150 to 180 plus fish days his group had just experienced. Quickly I surmised that most of their numbers were inshore species and among eight fishers the numbers quickly came to within what we had just experienced. In fact we did more Dorado in the one day than they had in several. Mainly that was due to the fact they had targeted inshore species. For the next several days the routine remained the same. One day we encountered a large school of fish similar to Pompano. These fish were in an area approximately forty feet by forty feet, next to or on top of each other it seemed as though there was little room for even a sardine. We approached the school and Igor cast into it. They split in half and not one fish had interest in the fly. Later we learned that they eat a fish approximately 1/2 inch long. The 2 1/2 inch fly we cast scattered the school in several directions, all away from us and the fly. The numbers of Dorado this year seemed to be less than last year, yet they were there and accommodating when found. One day the waves were high and the water rough. This day we switched partners. I fished with Ed, and Igor and Dave went together. Igor and Dave hit the Bahia de Muertos (Bay of the Dead). They had a great day and did well. Brought in several tuna, one of which we ate that evening. Meanwhile Ed and I were in the middle of this heavy water and located tuna. Fishing with a Ten wt rod and matching reel my second cast produced a tuna. A tuna that I could barely budge for about 1/2 hour. While I was hooked up Ed got a shot at a twenty -twenty five lb. Dorado. He hooked up and bet me that he would land his fish before me. Nice bet - my guide estimated my tuna at 25 kilos. Well we were both wrong. My reel seized up and the tuna was gone. All I have is the pile of backing and parts. Never-the-less, it proved to be another good day. Everyone continued to catch fish. That evening we had Cevichi and Sashmi along with Margaritas. We remembered the previous year and the stories told around the table the year earlier. We also had new stories and events to memorialize. The days came and went and the new stories grew. Ed and Dave left this morning and it was our last day. Igor and I had been fishing while the guide caught sardines. Off in the distance we noticed a group of fish busting water. Heading over to the school we quickly cast into it and found 3 lb. green backed skippies. The action was hot. We could hook up, land the fish and be right back into another hook up. It lasted approximately an hour, and we yearned for other species. Sick, well there were other types of fish to be caught. Motoring deeper into the channel our guide soon located a school of tuna. We cast and hooked 15 lb. skippies. The action continued nearly nonstop. As fast as we got one fish off and recast we were into another one. Soon the Tuna were being more aggressive and we caught more Tuna than Skippys. Then all of sudden the Tuna were busting within 1 foot of the boat. Igor said, ? It was like fishing in a fish tank?. You could actually observe the action from under the boat to the surface and see individual fish bust the surface. For the next three hours we caught and fought Tuna with an occasional Dorado. It was a magic day. It reminded Igor and I of last year when we had Dorado action for nearly 4 hours straight. As fast as we landed one fish we were into another one with double hooks ups all the time. This was the highlight of our trip. It would have been hard to get any better. Our thoughts are on next year and planning the third annual Baja Saltwater Fishout.